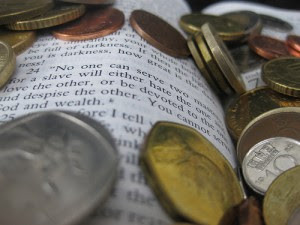 The Biblical World: Who wants to be a Bible millionaire? I am sorry folks. I know that between Amish vigilantes and Jesus Ween I have posted some offbeat stuff this week. But I only post what I find. For this Wednesday I would like to draw your attention to a new App for your iPhone. It is a combination Bible trivia and slot machine. Players answer questions about the Bible. Each correct answer brings the player closer to the $1,000,000 prize. There is no mention of any an actual cash prize if you get all of the questions right. But you will be given an opportunity to buy one of the organizations books, which they describe as "a future best seller." Hmm, I should start describing my books that way. Below is what the article has to say as well as a video demonstration. San Jose, California – Morals and Integrity Publishing, a San Jose Area based Charity Organization, announced today the release of its iPhone app, Make Me A Bible Millionaire 1.1, on the iTunes App Store. Make Me A Bible Millionaire allows iPhone, iPad and iPod touch users to learn the Word of God in an innovative fun way while challenging themselves to reach the $1,000,000 dollar prize. Challenge yourself and friends to see who can reach the top prize first. There are 200 questions in four groups which are constantly rotating, making the game challenging each time you play. Make Me A Bible Millionaire will help you remember and recite Holy Bible scriptures, names and places in the Bible. There are links given to purchase items such as the future best-selling book God’s Voice Your Choice which is said to cause God to never stop talking to you. There are also opportunities to win real cash prizes. This game is one of a kind and will likely be around for a long time. The game was tested on children ages 7-10 and the constant playing caused the children to remember and recite Bible information that grown adults who have been in the church for twenty years didn’t know. With 16 questions ranging from $200 to $1,000,000 you will enjoy yourself playing Make Me A Bible Millionaire. You can buy the app at bold4jesus.com. As with the previous posts, I won't comment any further and allow you to reach your own conclusions. God has given us many excellent reasons for loving and learning His word, not including cash prizes. Perhaps the presence of a full moon this week explains all this mishegoss.